North Shore Physicians Group offers exceptional family medicine specialists. North Shore Physicians Group (NSPG) offers patients on the North Shore a variety of primary care options, including excellent family medicine specialists. A family medicine doctor is trained to provide primary care for the entire family, from infants through adolescents and adults. Family medicine specialists also provide some basic preventive care that geriatric care doctors provide. Our family medicine specialists conduct annual exams, age-appropriate screenings, and vaccinations, along with other types of preventive care. When a medical issue requires a different type of specialist, our family medicine specialists can refer you to specialists in the Partners HealthCare network, including North Shore Medical Center on the North Shore, and Massachusetts General Hospital and Brigham and Women’s Hospital in Boston. The benefits of primary care with family medicine specialists. Choosing one of our family medicine specialists as your primary care provider offers a number of advantages for your family. Communication is easier and scheduling is more convenient when a single doctor can treat all members of the family. Family medicine specialists tend to have a deeper understanding of family health history and intergenerational dynamics, enabling them to provide continuity of care and to keep an eye on the medical issues that may affect each generation. As a patient of one of our family medicine specialists you will have access to Patient Gateway, a secure online portal that connects you with your family medicine practice and all of your specialists. You can use Patient Gateway to communicate with your physicians, view your medical records, refill prescriptions, and request appointments and referrals. To find family medicine specialists or other primary care physicians near you, use the Find a Doctor search on our website. You can find a specialist such as an obstetrics-gynecology physician, or combine a search for a specialty with a location, such as pulmonary medicine physician in Danvers. You can also filter results by gender, by languages spokenn and by the status "accepting new patients." 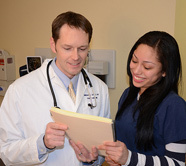 Additional care options available through family medicine specialists at NSPG. Shared medical appointments which provide patients with longer, education-focused appointments with their physician and a support group of six to ten other patients. Our patient-centered medical home model of care where a primary care physician leads a team of providers focused on the health and wellness of each patient. Concierge physicians, who limit the number of patients they see in order to provide each patient with more personal attention and faster access to care.